We went away for a couple of days for a very small vacation. I brought a novel to read and a notebook so that I could start writing a novel. And guess what I did instead? I read a field guide to insects and spiders. I’m completely charmed by the names of the various crawling and winged creatures. And this leads us, Ordinary friends, to another installment of our sporadic series on found poetry: the unconscious poetry of bug names. Who doesn’t want to read about worms and beetles on a food blog? As I read through the guide I thought about the people who had named these bugs. Some seem to have had a very good imagination and a sly sense of humor. Others seem appealingly earnest and literal. But the one thing that they have in common is that they all seem to have a real affection for the creature they’re naming. They’ve studied it and learned all they can about its form and its habits. Maybe they even take credit for discovering this tiny life form, and they’ve named it for themselves, with their own names. They name them for their appearance, they name them for what they once were or what they’ll become, for the way that they were before their great change, or the way they will be after it. They name them for the job that they do. They’re called after what they eat and where they live, their home and their sustenance. We have question marks and painted ladies, phantom midges, predacious diving beetles, darners and diggers and borers and pruners and skimmers and elaters (elaters!!) Cloudywinged aphids, snow fleas cat fleas human fleas, snow lice, hog lice and bird lice. Firebrats and jumping bristletails. Ferocious waterbugs and Eastern toe-biters. Treehoppers, leafhoppers, sharpshooters. You’ve got your eastern cone nose and your jagged ambush bug, your boll, pine, bean, alfalfa, rose and lesser cloverleaf weevils. And the beetles! O, the beetles! Elegant checkered beetles and their coarse cousins rough fungus beetles, spotless nine-spotted ladybugs, willow leaf beetles and harlequin beetles, fire beetles and blister beetles, iron clad beetles and patent leather beetles. You have both dainty tiger beetles and beautiful tiger beetles. Somebody loved tiger beetles! Dragon lubber grasshoppers, differential grasshoppers, toothpick grasshoppers and true katydids. Bearded robber flies, phantom crane flies, march flies, marsh flies, flesh flies. The moths are fairies and gypsies and sweethearts and witches and beauties, and the butterflies are wood nymphs and satyrs and elfin. What a world of characters we have flying around our heads and buzzing in our ears and crawling through the grass at our feet! Who is hungry now?!? This has been a summer of beets, squash and tomatoes, as all summers should be. And we’ve made a lot of tarts, as everyone should do! We mix it up though. Sometimes the vegetables are in the custard, sometimes they’re on top. Sometimes we add nuts, and we almost always add cheese, but we mix it up a bit, we use different kinds. 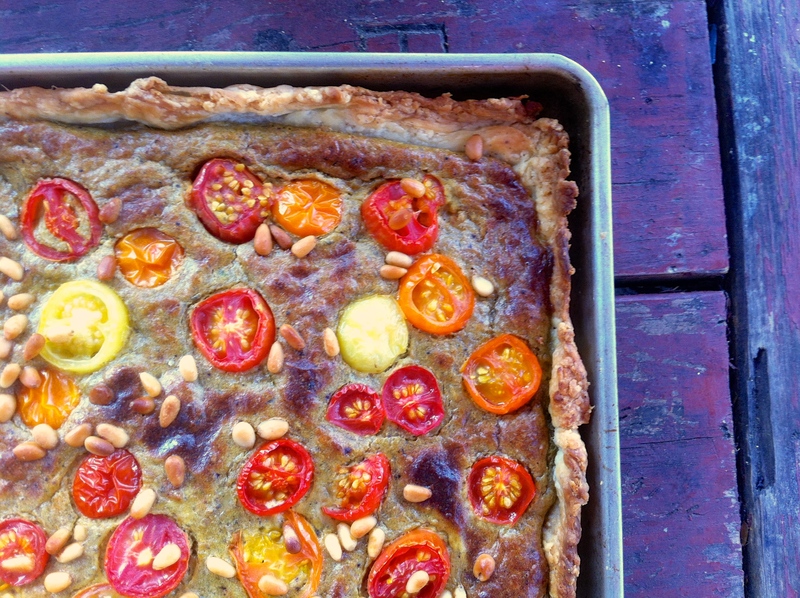 This tart had roasted yellow squash and beets mixed up with a pistachio/pine nut custard and topped with pretty multi-colored cherry and grape tomatoes. Here’s Leadbelly with Boll Weevil. In a large bowl combine the flour, salt, and pepper. Grate in the butter and then mix with a fork until coarse and crumbly. Add just enough ice water to pull the whole thing together into a workable dough. Knead for about a minute to be sure the butter is evenly distributed. Form into a ball, flatten, wrap in foil and chill in the fridge for at least half an hour. Peel and trim the beets and trim and roughly chop the squash. Put these in the food processor and process until they’re diced quite fine. Combine them with the shallot, garlic, olive oil and rosemary and spread in a single layer on a baking sheet. Roast the vegetables until they’re starting to brown and caramelize. Stir them often so they brown evenly. Set aside. In a food processor (you can use the same one, and you don’t have to clean it!) combine the eggs, milk, pistachios, pine nuts, pesto and goat cheese and process until completely smooth. Add the vegetables, and process until they’re broken down. It doesn’t need to be completely smooth, it can still have some texture, but you don’t want it to be too chunky. Pour this into the crust. Preheat the oven to 425, lightly butter a tart pan. Roll out the dough and spread it over the pan, building up the sides to form a crust. Bake for five or so minutes, until it looses its shine and you’re sure it will hold it’s shape. If the edges fall, push them back up with the back of a spoon. Arrange the tomatoes in a pretty pattern or randomly on top. scatter the pine nuts over the top. Bake for 20 to 25 minutes until puffed and golden. Take from the oven and scatter fresh basil over the top. 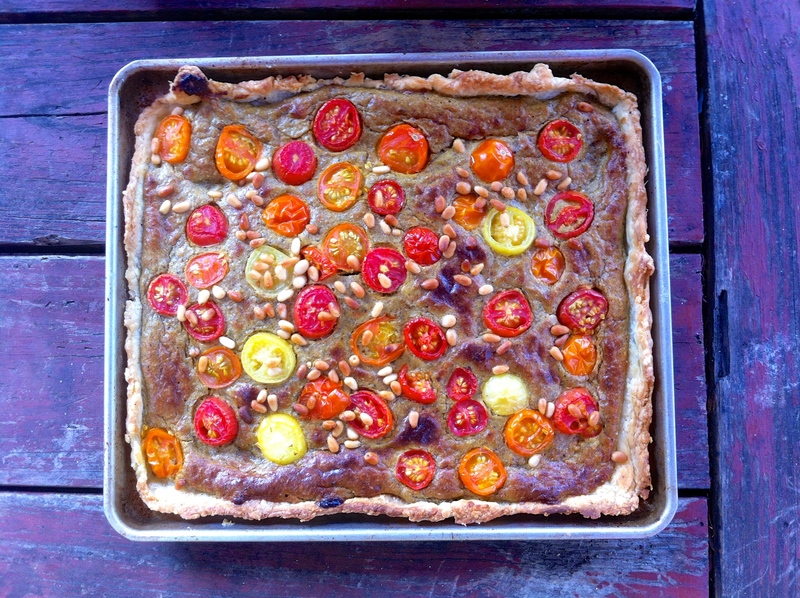 This entry was posted in basic pie filling, crust, pie, recipe, tomatoes, Uncategorized and tagged beet, pinenut, pistachio, squash, summer tart, tart by Claire. Bookmark the permalink. I like the dainty tiger beetle, in my mind it has the head of a tiger from a Rousseau painting, but with striped wings and beetle body. The tart looks yummy, with I was braver with pastry. Beth, I love your vision of a tiger beetle. It would be fun to draw all the bugs just based on their names. Maybe I’ll have the boys do that!